I wrote on Twitter recently that not much surprises me with regards to Wirral Council. 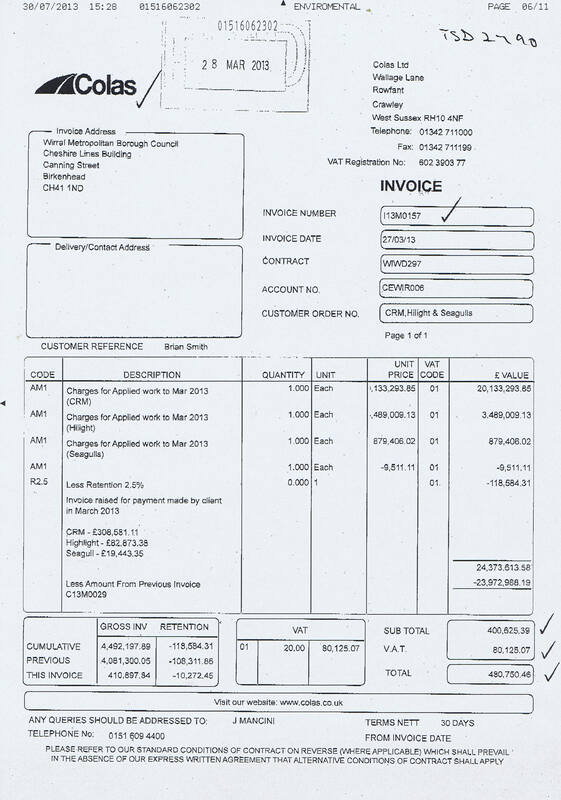 However this Colas invoice, you can click on the image for a larger version, received by Wirral Council in March from Colas is for £879,406.02 (+VAT) for work raised through its Seagulls system. The detail as to what the taxpayer gets for just over £1 million spent on this item isn’t detailed on the invoice but a part of the contract details what the work on Seagulls refers to. The Colas contract shows that the Council has to raise work orders with Colas through a system that Wirral Council called Seagulls which keeps a track of various assets like drainage gullies. The Colas contract for Seagulls (and other matters) runs to 2014 and Wirral Council is looking for another company to do the work under a new contract. Colas seem to have a licence to print money from Wirral Technical services. Well the Colas contract comes to an end next year and Wirral Council will be putting it out to tender (I think Colas have already stated they won’t bid for it). Having read the Colas contract, there’s an agreed schedule of rates, then Colas gets an extra 4.5% on top of that, even if they subcontract the work. The entire contract is about 500 pages long, so you can see why I haven’t scanned it in and published it! I do know that one of the Wirral Council committees has a review of this contract on its work program. Reblogged this on Karl Mercer for Councillor of Seacombe. Edited by JB 29.10.17 Links to deleted blog removed. You are partially right, although the invoice is not for software. It’s for work raised through work orders generated by the Seagull system. I’ve read through the 500 odd page contract and the second time I read through I found this. The Technical Services Department is responsible for maintaining the highway drainage assets of the Authority. These comprise 55,000 gullies and 8,000m of drainage channels, located within the adopted highway and car parks maintained by Wirral. The “Seagulls” system was developed by a consultant for Wirral in 2006 and comprises an Access database linked to MapInfo GIS spatial data. The system allows staff to view a complete cleansing history of a particular drainage asset as well as edit asset data, enter new assets, order work and monitor expenditure. Analysis can be undertaken of the planned and reactive cleansing details to identify trends or problem areas and arrange appropriate action. Seagulls ensures that all Wirral’s highway drainage assets are monitored for cleansing in accordance the appropriate frequencies. The database can also be used to distinguish between Wirral’s highway drainage assets and the private drainage assets within unadopted areas, which are not the responsibility of the Technical Services Department. Data is currently recived from the Contractor in the form of an Excel spreadsheet, but can be imported as a CSV or XML file. The data is received from the Contractor on a regular basis and is a list of all the gully/channel cleansing work undertaken for a particular date. The file also provides information about any problems encountered whilst attempting to carry out maintenane work. Orders are despatched to the Contractor as Excel files and contain details of the work that must be undertaken. Jobs are raised against the Schedule of Rates agreed within the contract. When the order has been completed the Contractor will return a copy which contains details of the actual work carried out. An import procedure adds this data to the original order which can then be viewed by either selecting it directly or by looking at a particular asset and viewing its Order history. It is possible to search for all visits undertaken by the Contractor where cleansing was not able to take place because of a problem (eg a vehicle over a gulley). A library of reports can be run from within the database, including permutations of incident Analysis by Type; Service Levels; No Inspections by Type or Date; Works Not Completed; etc. The system also has a facility to reference photographs of any asset and one photograph can be assigned to multiple assets of mixed types if appropriate. John, thanks for the explanation but was I just ‘partially’ right? I think I was about 95 per cent right – but used the word “software” instead of “management system”, so got docked 5 per cent. The Highways Dept has always been split into 3 main areas: Roads (CRM) Lighting (Hilight) and Drainage (Seagulls). In many years of attending public meetings at Wirral Council where the street cleansing issue has been raised many times, to my recollection the word Seagulls has not been uttered by an officer. As you well know, software licences for Access and MapInfo would come out of the IT departments budget and not the technical services department budget. As referred to above the Seagulls system was developed in 2006, so forever would seem to be 7 years, unless the predecessor was also called Seagulls. Since the senior management got restructured, there is no longer a highways department. There’s either traffic and transport or highways management which come under the Head of Environment and Regulation. In answer to your question, the original post was wrong on the capital letter of Seagulls. Street cleansing wouldn’t be so expensive if people didn’t throw litter from their cars. £1 million was cut out of the street cleansing budget this financial year, so I wasn’t the only person that thought spending on Seagulls was high. Looking through the contract Colas makes 4.5% profit on what they charge (estimated at £8 million a year). So if they instantly wanted to save about ~£360k a year all they have to do is bring it back in house next year…. However thanksfo pointing out what Seagulls meant. John! What happened to your original post? The one that fumed at great length about £879k of our council tax money being wasted on seagulls – you know, the feathered variety? And how we are bounded by 2 x estuaries and the Irish Sea; and how we should be used to them being on the coast and all that, and how… etc. etc. “I wrote on Twitter recently that not much surprises me with regards to Wirral Council. 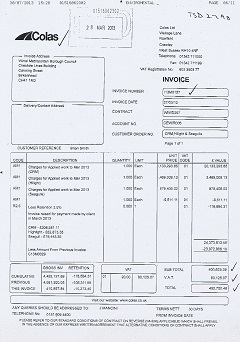 However this Colas invoice (you can click on the image for a larger version) details an invoice Wirral Council received in March from Colas for £879,406.02 (+VAT) for work involving seagulls. Well strictly speaking when I requested these Colas invoices (I have more than just this one) as part of my rights under the audit, the wording of the request by my reading of the request would’ve also covered the Excel files which detailed the actual work undertaken through the Seagulls system. The original request was “a copy of the contract with and invoices to do with Colas Ltd”. However, in a phrase which probably sounds familiar from FOI requests, they regarded this as an “unreasonable request” and agreed instead to the twelve largest invoices and a copy of the contract, with some concern expressed that this contract was out to tender… although I suppose they still wouldn’t have regarded the Excel orders detailing the work carried out as an invoice. I do however have an invoice from Colas stating Wirral Council have overpaid by about £0.5 million on previous invoices which rather ironically is stamped as “Paid” and the whole thing is just classed as a credit towards future invoces. I’m probably on safer terms writing about that aren’t I?